CableFree is introducing our new Diamond Microwave dual-core platform, a high capacity, modern IP microwave radio link offering up to 2Gbps Full Duplex net throughput for diverse applications including 4G/LTE Backhaul, corporate networks, CCTV, Safe Cities and Wireless ISP backbones. CableFree Diamond is a Full Outdoor Radio for Zero-Footprint deployment, eliminating requirement for indoor locations or rack space. The radio is typically mounted on roof-top or tower location with antenna, with Power-over-Ethernet (PoE) connection to the radio using a single Cat5/e/6 cable. An optional SFP optical fibre interface is available for sites where long cable runs or electrical isolation to the radio is required. Licensed and Unlicensed bands supported. Low Power Consumption supports “Green” initiatives and use with alternative off-grid power sources such as Solar+Battery for remote mountain-top repeater sites where no AC power is available. 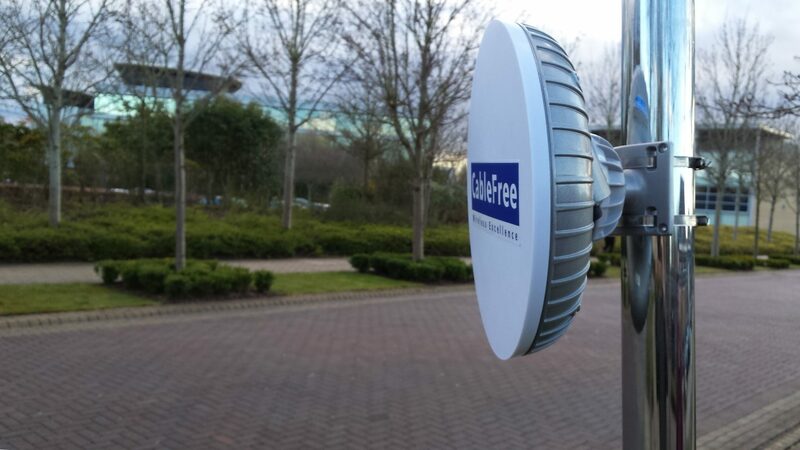 CableFree Diamond features industry-leading specifications including high capacity up to 2Gbps, advanced modulation up to 2048QAM for high spectral efficiency, full support for ETSI and ANSI channel plans from 10MHz up to 112MHz. Automatic Coding and Modulation (ACM) dynamically adjusts the link capacity in adverse conditions, enabling operators to offer extended distances, higher availability, and utilise smaller antennas to fit within size, aesthetic and budget constraints. High output power up to 25dBm or more ensures best possible link margins for long range links. All CableFree Microwave links are easy to install and fully manageable with easy-to-use Web NMS as well as network-wide SNMP platforms. Link Aggregation of 2+0, 4+0 or higher combinations channels together to achieve multi-Gigabit capacities of 4Gbps and beyond. CableFree Diamond is a Rugged, full-outdoor design suited long-term operation in harsh climates. CableFree Diamond integrates two complete radio cores with the XPIC technology: this allows simultaneous transmission of both radios on each of Horizontal and Vertical polarities in the same frequency band and channel without interference. This doubles the capacity and spectral efficiency compared to a non-XPIC radio. By integrating XPIC into the radio, RF losses are far lower than traditional discrete solutions that require two separate Microwave ODUs and a coupler. Integrated XPIC ensures higher signal fidelity and better link margins, which translate to longer range and higher availability. Unique to CableFree, the Diamond links are available in licensed bands (3.5 to 42GHz) as well as Unlicensed band (5GHz, 17GHz, 24GHz) versions. This flexibility enables operators to mix/match or upgrade sections of their networks, and to evolve as time and customer pressures for capacity and coverage increase. Note: Not all bands are Unlicensed in all countries. Local regulation will apply. Check with your local Telecom Regulator to be sure. CableFree Microwave Links can be configured in 4+0 Configuration using Microwave Combiners for Double Capacity applications and increased Resilience: with no Single Point for Failure in active transmission path, the system availability is dramatically increased. 4+0 configuration increases the Diamond system capacity from 2Gbps up to 4Gbps full duplex for Multi-Gigabit capacities in modern networks. Higher speed configurations are possible with Dual 2+0 and 4+0 microwave link configurations if required to enable future network growth requirements. CableFree Diamond can also be used as part of CableFree UNITY solutions along with MMW and other technologies to increase range, throughput and availability.